David Ross will not be eligible to return until Aug. 18. 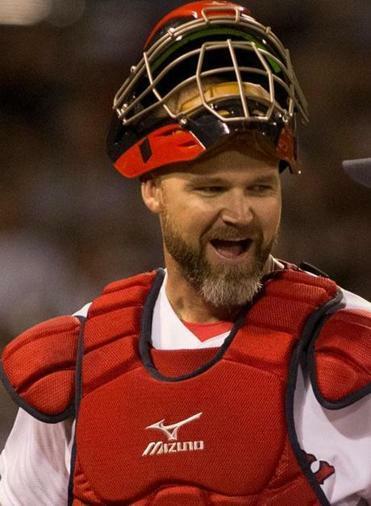 The Red Sox moved backup catcher David Ross to the 60-day disabled list Tuesday, acknowledging that he faces a lengthy recovery from two concussions. Ross will not be eligible to return until Aug. 18. But he expects to be ready by then, according to agent Ryan Gleichowski. It is a significant loss for the Red Sox. When general manager Ben Cherington set about rebuilding the roster last fall, Ross was the first free agent he contacted. The 36-year-old was valued for his ability to handle a pitching staff and had the personality to help change the tone in the clubhouse. Ross suffered the two concussions in a span of 33 days when foul balls struck the front of his mask. He was on the disabled list from May 12-24 and returned there on June 18 after being injured during a game against Baltimore. Until this year, Ross never had suffered a concussion. A specialist, Dr. Michael Collins of the University of Pittsburgh Medical Center, examined Ross on June 20. He recommended Ross leave the team and return to his home in Florida to recover. Because Ross has had two concussions, it’s difficult to project when he could return. He also would need time to get back in playing shape before being activated. Collins will examine Ross again on July 9. Ryan Lavarnway is backing up Saltalamacchia in the absence of Ross. Rookie righthander Allen Webster is scheduled to start Friday, the second game of the series against Toronto. He is 0-2 with an 11.25 earned run average in three starts. The Sox could have called up Alfredo Aceves or Rubby De La Rosa for the start. But manager John Farrell likes the matchup against the Blue Jays, a team Webster pitched well against in spring training. Given his halting progress to date, predicting when Clay Buchholz will next pitch for the Red Sox is tricky. But there is some clarity to the situation. The hope is that Buchholz will throw in the bullpen Wednesday and again on Friday. Farrell said the first bullpen session would be more for Buchholz to get accustomed to being back on the mound. The second would increase in intensity and be longer. Buchholz hasn’t pitched off a mound since June 8. Barring a setback, Buchholz could pitch in a minor league game Sunday or Monday. “That would be ideal,” Farrell said. Farrell is unsure whether Buchholz would need more than one rehabilitation game before rejoining the major league rotation. “We would have to evaluate that and kind of see where he’s at. Physically and from an overall performance and stuff standpoint,” Farrell said. Lefthander Franklin Morales was placed on the 15-day disabled list with a strained left pectoral muscle, an injury similar to the one he had in early April. Morales has appeared in only six games since last Aug. 23 because of assorted injuries. Righthander Pedro Beato was recalled from Triple A Pawtucket. But his stay could be brief. Righthander Clayton Mortensen is eligible to come off the disabled list Wednesday and the Red Sox intend to activate him. Mortensen went on the DL June 11 with what the team said was a groin strain. He started a rehabilitation assignment with Pawtucket last week and appeared in three games. Mortensen was at Fenway Park Tuesday. Since June 11, the Red Sox have made 15 roster moves involving their pitching staff. They intended to wait until Wednesday to swap Morales for Mortensen. But the threat of a rain delay Tuesday prompted the arrival of Beato. The Red Sox had a close connection to former Celtics coach Doc Rivers. He twice was invited to speak at the team’s rookie development program in January and gave memorable presentations, according to assistant general manager Mike Hazen. Rivers also had a close relationship with former Red Sox manager Terry Francona . . . Shane Victorino, who left Sunday’s game in the eighth inning because of a sore back, returned to the lineup. He was treated on Monday and had no lingering soreness . . . Brandon Snyder, who was called up to replace Will Middlebrooks on the roster, is the new emergency catcher. He was drafted as a catcher and caught 79 games in the minors . . . Jose Iglesias has reached base safely in 27 consecutive games. It’s the longest single-season streak by a Red Sox player since Dustin Pedroia went 37 games in 2011 . . . Colorado’s Michael Cuddyer extended his hit streak to 22 games with an infield single in the fourth inning. He has reached safely in 41 straight . . . The Sox have won five of their last six at Fenway . . . Jacoby Ellsbury was 3 for 5, including a leadoff double in the first inning. He has 20 hits to lead off a game this season, the most in the American League . . . Including the 2007 World Series, Pedroia is 11 for 26 with three doubles, four homers, and 13 RBIs in 10 games against the Rockies . . . NESN analyst Jerry Remy, out since May 28 because of illness, returned to the booth . . . With Andris Nelsons conducting, 11 tuxedo-clad members of the Boston Symphony Orchestra performed Modest Mussorgsky’s “Great Gate of Kiev” in left field before the game. Nelson threw out the first pitch with gusto, sailing it over the head of Lavarnway.